It’s the time of year when resolutions abound and everyone is committing themselves to a cleaner, leaner, serener 2015. I have a bold resolution to add to the list: find better trash in the new year. Are you less than enthusiastic about your trash finds in 2014? Do you long to roam the streets confidently picking up the choicest roadside discards? Well, dream no more. Resolve to bring home the top shelf trash in 2015 and prosper. To assuage your sadness over your heretofore subpar trash, in today’s edition of Great Trash Finds, I share with you the worst Frugalwoods scavenges. These are all things that have utility, but they’re not gems in the canon of truly great trash finds. But alas, we can’t find a coat, or a J Crew shirt, or a fondue pot every time we trash hunt. I hesitate to denigrate anything free, but, this stuff is pretty weak sauce. This is actually some fairly high quality paper, but, the rolls are half empty. I’ll still use it to wrap gifts, but it’s certainly no winner of a find. Also, who the heck throws out perfectly serviceable wrapping paper? Are they never going to wrap a present ever again? 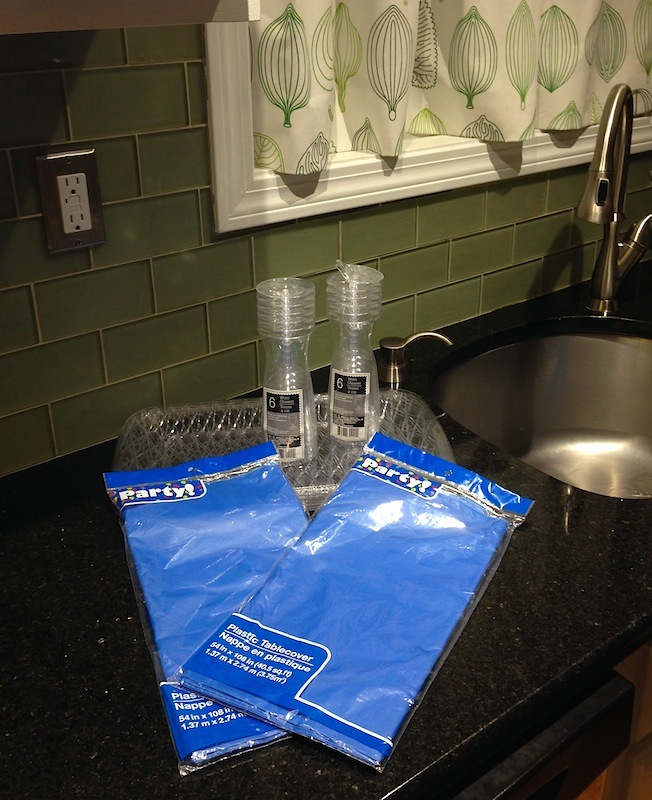 I present to you: three plastic trays, two plastic tablecloths, and 12 plastic wine glasses. I’m not one for plastics, but, this find was too good (terrible?) to pass up. I figure it’ll come in handy next summer for a BBQ on our minuscule urban patio. At the very least, we can pose Frugal Hound with one of the wine glasses on New Year’s Eve. Such a party hound. Eh. It’s just dull. I couldn’t even get it to look interesting in a photo. I mean, this isn’t a bad thing to find, it’s just rather boring. But hey, power strips aren’t cheap, so I suppose this was a fairly decent find all things considered. Still, a power strip? Come on streets of Cambridge, you can do better. This might be the worst of the entire lot. Ceiling hooks? Seriously? Beside being just a really odd thing to set out in a free box by the side of the road, these hooks are not exactly woot-worthy. However, my epic tinkerer, Mr. FW, will employ them in one project or another. His motto: never turn down free tools or building materials. Not sure what this thing is actually called, but its function is pretty self-explanatory. Perhaps even more mundane than the power strip, I’d forgotten this was even from the trash it’s so prosaic. Here’s to better trash in 2015! What do you hope to scavenge in the new year? The outlet mutliplier is a GREAT find =) Those things are so insanely handy! Haha, true! So true! It can’t help its humble appearance. I’m so in awe of you guys’ awesome trash finds, but too wimpy to take the plunge myself into dumpster diving. My brother, who is a trash hauler, however, comes home with some rockin’ good stuff! I’d love to read a ‘how to’ on choosing where and when to look for trash finds. Although I’m sure it isn’t that easy. I need one of those ceiling hooks!!! I would totally give you one :)! This is comforting because I am the master of Not Great trash finds. I’m not you’re not just finding gold out there. I found a bunch of slate roof tiles in the alley by my house and brought those home, figuring that slate is expensive and they could (?) be useful. Of course they all turned out to be broken, but maybe I’ll use them one day. I found a cookie sheet which is now my cookie sheet most likely to burn something, a vacuum which only kind of worked, and kitchen utensils which ended up being useless and thrown back out. Hahah, it’s definitely hit or miss in the wonderful world of trash finds. We also have a trash cookie sheet, which we’ve discovered is sort of bent and thus sometimes burns things… I bet you’ll find some sort of use for those broken slate tiles. It’s an interesting material at the very least–could be an art/design project maybe? What do you mean these are not great trash finds?! Any usable thing you pull out of the trash is a great find as it will not be going directly to the landfill. I find wrapping paper all the time, especially the high-quality stuff sold through fundraisers.. Since we have mostly apartments around us, I assume it is because it’s too hard to move wrapping paper (ha ha!). Their loss is your gain. Great trash scouting, FrugalWoods! 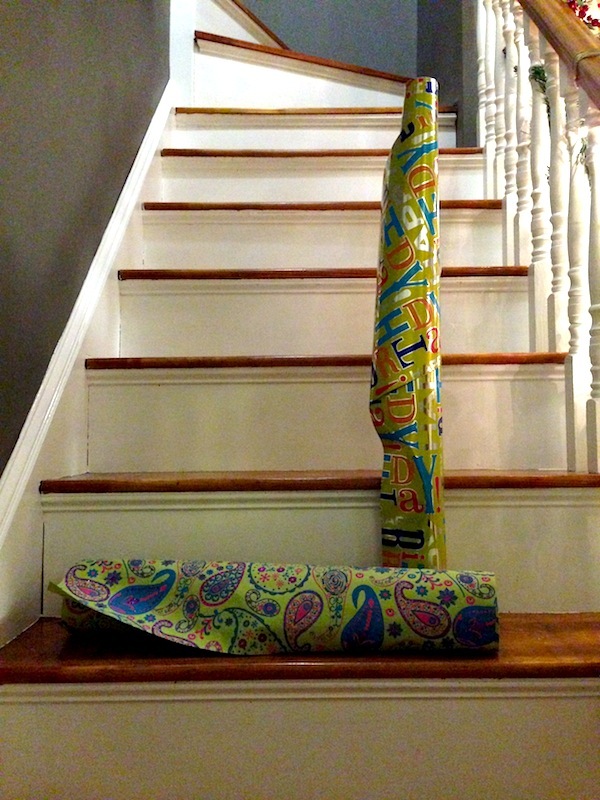 I guess wrapping paper is sort of long and awkward to pack…. but come on people ;)! I agree with you–I’m always happy when something can be saved from the landfill and repurposed in one way or another. Ha! This is awesome! You know my sister is one of those people that throws out perfectly good things. I mean fully functional and on trend lamps, Banana Republic dresses, live house plants! I assume it’s just easier rather than storing/saving/moving it? My mom then pulls it out of the trash when she visits. She has started to save some clothing items for me to try on now. I own three of those exact rectangular plastic trays (which did set me back $3 at the dollar store!). I use those when going to potlucks, so if I forget to take it home or it’s still being used when I leave, I’m not too sad to leave it behind. But really I find them very handy when I host parties since we don’t own enough legit serving platters. Good find! I haven’t scored any trash finds in my town, but I recall when I was a kid in the country, my mom did find lots of nice things set out at the curb like a gliding rocking chair, TVs, shelves, push lawn mower, etc. That’s pretty awesome that your mom is rescuing your sister’s throw aways. I’d do the same thing–sounds like she’s getting rid of some decent stuff! Good point about the platters, they will be great for a potluck! Those look pretty awesome to me! As far as the plastic, at least you are getting use out of it before it’s thrown away, yeah? 🙂 I could use some cool patio furniture, so I’m putting that out to the Universe! 3) Champagne glasses (why would I buy them, I use them only 2-3x a year! I have friends that look down on me for bringing `garbage` into my home, but they just don`t see that is recycling at its finest and cheapest. Those are some fabulous finds!!! I love finding glassware too–we’re always accidentally breaking it, so it’s perfect to replace it with free stuff. Mr. FW recently found a whole box of wine and bourbon glasses. Woo hoo! And, nicely done on spray painting the former stool–I love refinishing furniture like that! Oh sad times for your trash hunting endeavors! 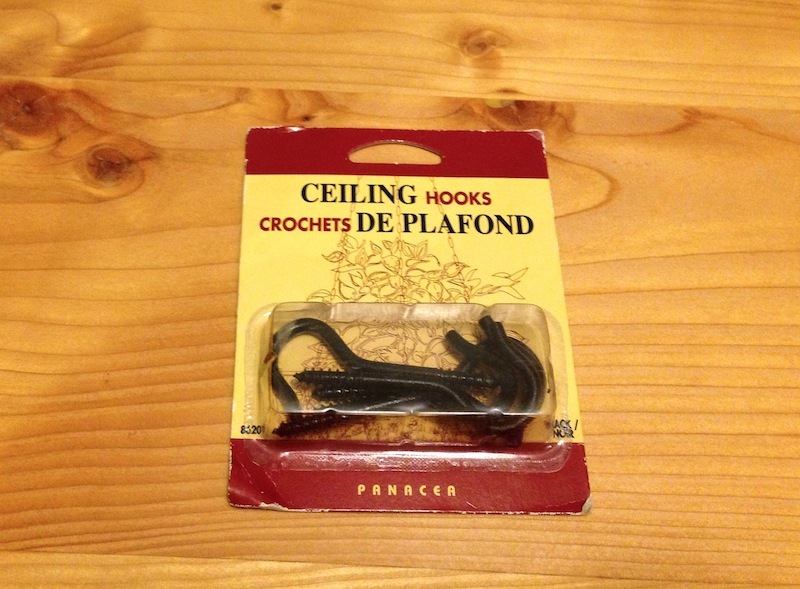 Maybe 2015 will be your year… maybe you’ll find your very own ceiling hooks :)! These seem like useful ones to me. I’ve been meaning to ask how you go about shopping for used clothes. Do you try it on at the second hand stores or what do you do if you find it on the street. Mostly asking for female clothes. I know you haven’t purchased anything lately bit I was wondering what your practice is. If I don’t try stuff on I don’t know if it will fit right but I don’t want to try stuff on atbsecond hand stores because its not like they wash it before putting it out. What do you do? I do indeed try clothes on at thrift stores. The places I frequent all have dressing rooms and I never know what’s going to look good until I try it on. For clothes found by the side of the road, I just look at the size and hold them up to me. I then wash the stuff at home before I wear it, but, I just try not to think about it when I try it on at the store :). Happy thrifting to you! This is hilarious! I love that I laugh so much when I read your posts. And of course, finding better trash would be a great part of 2015 – perhaps I will keep that in mind for myself! Your finds are great! Maybe they’re not as “Wow” as some other freebies you’ve scored in the past, but on the positive side, maybe people are becoming more conscious about just dumping good stuff into a landfill. Seems like freecycle & craiglist are bustling. So true! I do hope more people will donate or sell rather than toss. Much as I love free finds, I hate seeing so much perfectly usable stuff go into landfills. LOL! I think the power bar and outlet multiplier are excellent finds. Here’s to better 2015 scavenge finding. Thanks! They’re definitely functional. Happy trash hunting in 2015 :)! 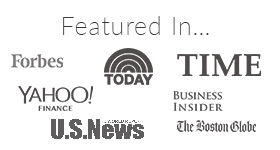 Those all look like perfectly good trash finds to me! I would use all of that stuff except the ceiling hooks. Well maybe even the ceiling hooks since my kid keeps bugging me to hang up the tiny bird house she built in summer camp. 2 years ago. Although a nail would work just as well. Love it! 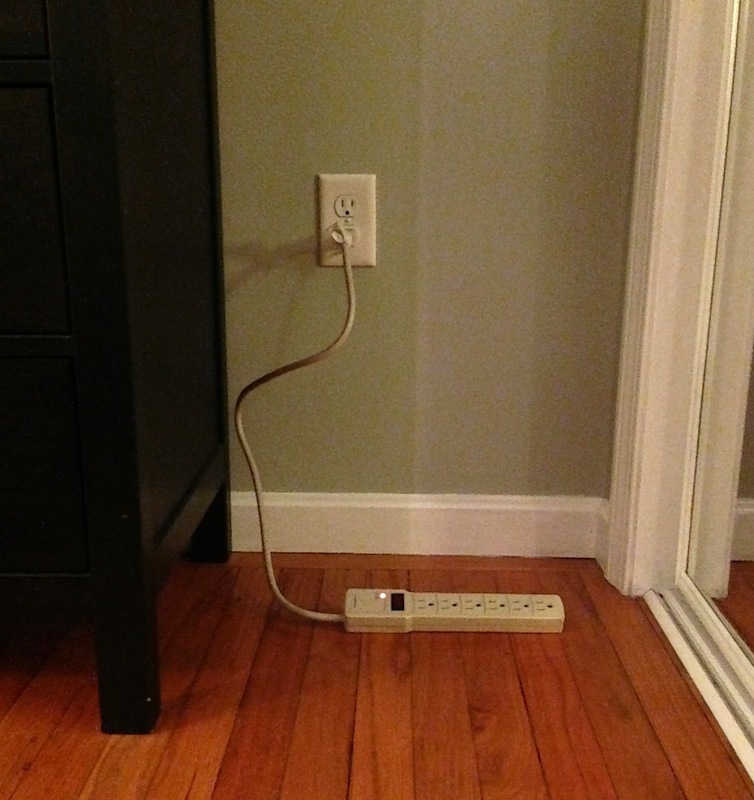 Especially the outlet multiplier and the power strip! We end up using those in a few places in our home! I agree that picking up stuff like that is recycling at its finest! We always seem to need another power strip for some project or another, so it is pretty useful. Definitely recycling at its finest–well said :)! Thanks! We really do hit the trash jackpot here in Cambridge. I’ve never seen so much free stuff in any other city we’ve lived in! And, agreed on the wrapping paper… what were those people thinking?! My 2014 trash finds have been decidedly meh. I scored two matching IKEA tables from two different places. The tables aren’t that great but I’m more excited about the fact that they actually match. I also found a huge, but really ugly art print on canvas (marked as $89.99 from Bed Bath & Beyond, which I can’t believe anyone paid for such a hideous print). I have high aspirations of painting something over it and hanging it in my living room. These are amazing finds! I want to cry. Your finds are amazing. We are not always this lucky. Great job! What a funny topic! About the only time I’ve taken stuff put out as trash was baked goods from the bakeries in NYC. That is just dumb! Wasting all that perfectly good food! They put out all the days baked goods in black trash bags on the sidewalk. All the college kids know about it and get free grub, good times. I am a bit of a minimalist so if I find I want to get rid of something I sell it. If I can’t sell it or know it won’t really sell, I’ll donate it to a thrift shop. Throwing out usable stuff is just plain dumb. Now that you brought this up, I remembered my neighborhood has a monthly bulk trash day. Hmmm…..perhaps I’ll go take a long walk on that day. Baked goods sound like the greatest trash find ever–yum! I agree on selling or donating. Much as I love finding free stuff, I do wish people would donate it instead. You should definitely take a walk on bulk trash day! Hahah, thanks! The curtain is not a trash find. I got it at IKEA about 7 years ago and it was originally a very long curtain (which we needed in our first apartment) and I hemmed it to make a shorter curtain for our current kitchen window :). I’m all about reusing! Great finds, and free is still free. 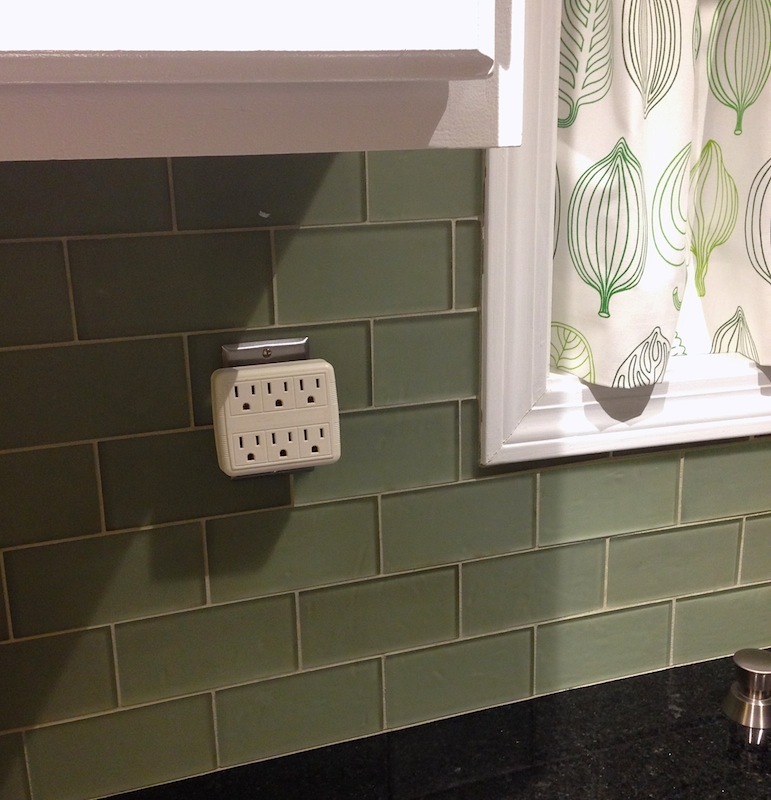 The power strips might be a bit risky, as they were in the trash maybe due to faulty issues. I wouldn’t want a free item, to damage an electrical outlet. Maybe in 2015, you can find some awesome Ugg boots, or a Cartier watch. Who knows what those Cambridge baller neighbors will throw out for your enjoyment. I actually thought the plastic wrapped plastic goods was an awesome trash find! Those things are not cheap and they come in handy when you have friends over that you don’t have to impress and don’t feel like doing the dishes. 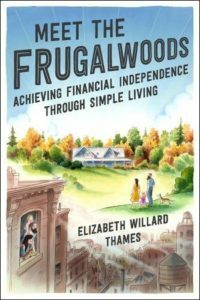 Anywho, I hope that you, Mr. Frugalwoods and Frugal Hound have a very happy and healthy new year!! See you in 2015!!! I agree! I’m thinking they’ll be perfect for an outdoor party next summer. Happy New Year to you too! Some of those are winners. Surge protectors are awesome, and underutilized. This list is funny because it looks like my birthday list. I ask for pretty mundane things like power strips. The other day we were at a large community party and we were in charge of cleaning up and tons of people left their nice plastic serving plates and my wife saved them all and used them for the holidays. It’s amazing what people just leave behind along with a lot of decent food on those trays. Being on clean-up duty certainly has its perks! I’m always happy to take leftover food in my office that no one wants. Free food is the best kind of food :). Way to go on snagging free trays too! I actually like all these trash finds, except for maybe the wrapping paper. The electrical stuff is really practical and useful and the party stuff is wrapped in plastic and you’ll definitely end up using them. Good finds imo! So true! It’s all pretty decent and useful stuff. 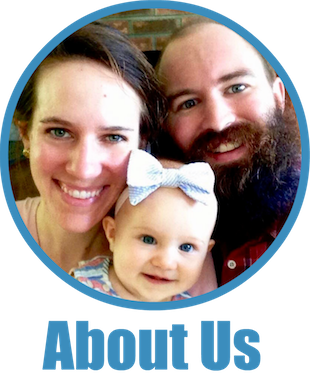 I’m continually amazed at how many perfectly good things we find in the trash! All practical finds, I am impressed. I usually get my finds on left overs from work events or when we are cleaning out/moving things to new locations. Thanks! Leftovers from work are awesome. I love when we have a meeting or event and there’s a ton of food leftover, which no one else seems to want. I’m all about it! I found it interesting that people in the US would put perfectly fine items on the curb for anyone to help themselves. I never got the nerve to get anything but I think I would have started doing so had I lived there longer. I have not seen this practice in other cities I have lived. It’s an unusual and unwritten rule in Cambridge that if you put things out by the curb, someone will come along and take them. We’re definitely not the only trash scavengers! It’s truly amazing the things that people will throw out. At one time (back in college), pretty much everything in my apartment was being discarded by someone else. So true! That’s awesome you were able to furnish with trash finds. People really do throw great stuff out! I would love the ceiling hooks. Our daughter has lots of crafts we could hang from the ceiling if we only had some hangers! I would totally give them to you :)! I am one of the people who sets out perfectly good stuff. I don’t know if this is often true, but I’ve read that some of the donation places, i.e. Goodwill, destroy a lot of things that they don’t think will sell. So I would rather things out and let another person have them for free! I do take some stuff to Goodwill, and occasionally I list free things on Craigslist.